7 Kids and Us: Jamba Juice NEW Protein Smoothies Are DELICIOUS! 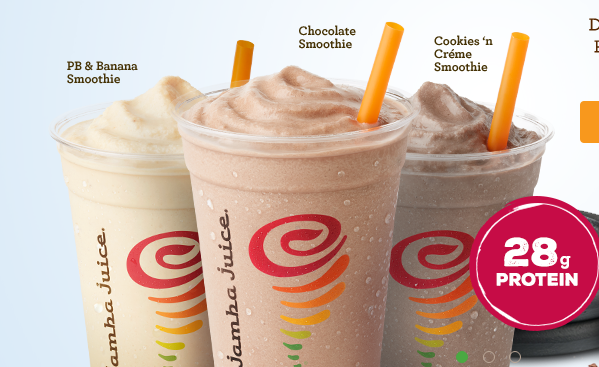 Recently Jamba Juice has added 3 new smoothies to their already awesome lineup. 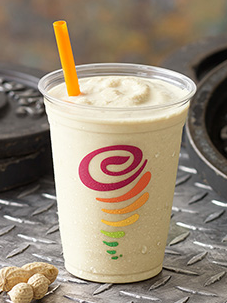 The new Protein Smoothies have at LEAST 28 grams of protein per serving. Perfect for pre and post workout, or just for when you are feeling like you need a boost. When I was pregnant with Riley I wasn't able to eat much...I remember that everything was unappealing, so my Dr. suggested I add protein powder to anything I was able to drink. I tried it, in a glass of chocolate milk and within moments I felt so much better. Since then, I have always been a fan of getting enough protein. I didn't even know I wasn't getting enough until I had the chocolate milk and realized this was how I was supposed to feel! My husband is always at the gym, 3 times a week, he is serious about a workout. He only does a few minutes of cardio, and the rest is on a machine, lifting weights or doing leg presses, squats, pull ups...he definitely gets a workout. Last week, after the gym, I took him to Jamba Juice where we both had the new Protein Smoothie, and he said not only did it taste great (it REALLY does!) but he felt a huge boost after drinking it. We will definitely be having these more often. 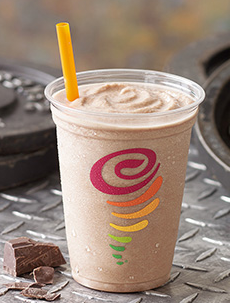 Chocolate: This is one smoothie that you’ll be craving before and after your workout. Because you know what they say—a spoonful of chocolate and banana helps the medicine go down. In the most delightful whey. Peanut Butter and Banana: Nothing goes together like peanut butter and bananas. They’re best friends. Compadres. Point is, there’s no tastier way to help get your daily dose of muscle-building protein. 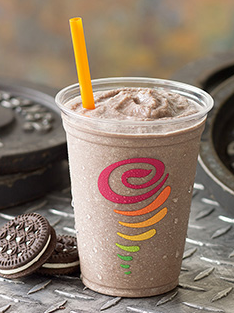 Cookies 'n Cream: It’s packed with protein. It’s bursting with cookies. The bananas can barely be contained. In fact, there’s so much flavor screaming to get out, we considered developing titanium cups for safety. Then we discovered the straw is a release valve.